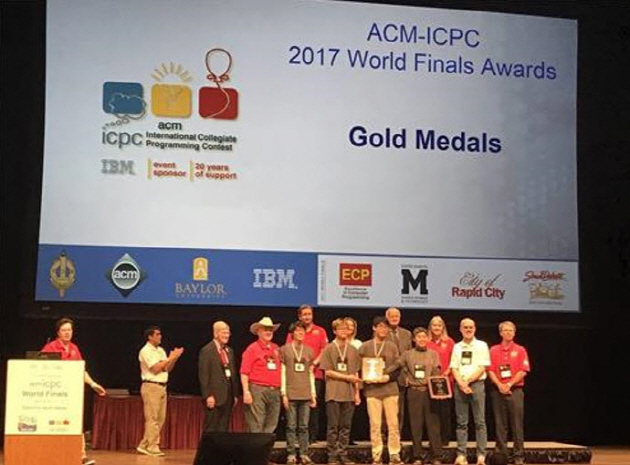 For avid lovers of computer programming, the Association for Computing Machinery (ACM) holds the annual International Collegiate Programming Contest World Finals, a competition open to university students from around the globe. In this year’s competition, which took place in Rapid City, South Dakota from May 20 to 25, SNU’s own “ACG Team” took home the gold medal. This is the first time in 16 years that any team from Korea has won the top prize. First held in 1977, the contest pits teams of three against each other in a grueling ordeal in which they must solve a series of complex problems within a five-hour time limit. This year, the teams were required to solve 12 problems that tested their skills in programming, algorithms, and teamwork strategies, ranking their performance according to accuracy and speed. Contestants must first go through local and regional rounds to be eligible to participate in the world finals. This year, a total of 134 teams vied for the ultimate prize. SNU competed alongside Korea Advanced Institute of Science and Technology (KAIST) as the two representative teams from South Korea. SNU’s team, consisting of Choi Seokhwan (20), Jo Seunghyeon (19), and Yoon Jeehak (19) tied for the gold with St. Petersburg Information Technologies Mechanics and Optics (ITMO) University, University of Warsaw, and St. Petersburg State University. Choi, the team leader, considers the first-place finish to be a result of his passion and hard work: “I became a programming fanatic after taking a software class in high school. Although I am contemplating employment and graduate school, I want to continue to improve my programming skills.” He selected Jo and Yoon for their outstanding performance as gold medalists of the International Olympiad in Informatics, an annual competition for programming for high school students, and for their reputations as high school computer sciences whizzes. The gold medal prize was $7500. SNU’s ACG Team also received a bonus of $1500 for solving problem number 4 faster than any other team.